When chosen wisely, link-up parties can be a good source of traffic to your blog. 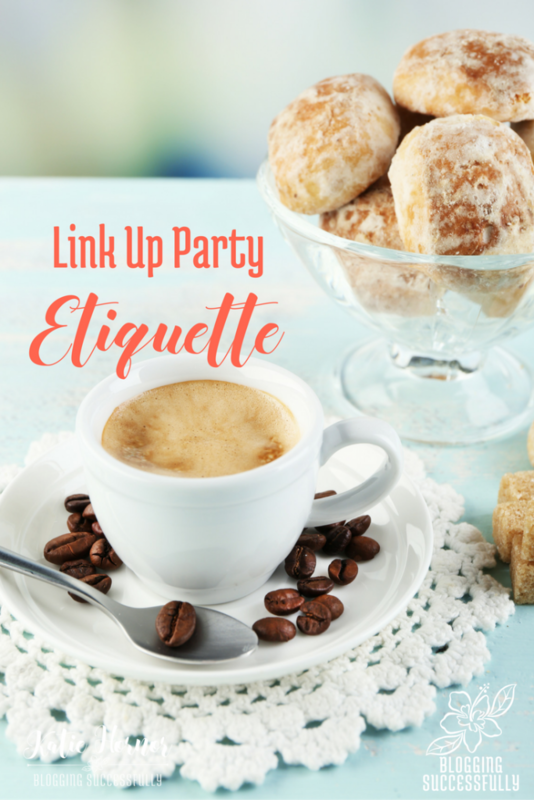 If you choose to participate in a link party it is important to remember these link-up party etiquette rules. Link-up parties are weekly or monthly events hosted by a blogger where other bloggers can submit blog post URLs to a linky. Sometimes the link-up parties are a particular theme and other times the only requirement is simply family friendly content. While link parties are typically for bloggers, readers also enjoy the large collection of blog posts all in one spot for their reading convenience. When you choose to participate in a link party as a blogger remember you are a guest on their blog and just like a guest to a party, it is important to be a good guest who follows certain rules and etiquette. If you are going to join link-up parties it is important to make sure that your blog post images are right clickable. When a blogger adds your image to their weekly link-up they will need to be able to right click on your image and save the image URL. Rather than hosting your image on their server, bloggers prefer to right click and grab your image URL to save not only space on their blog server but also time. As a blogger who has managed numerous weekly link-up parties I will pass over a blog post that I had planned on featuring if their image is not right clickable. Having your article featured on a weekly link-up can be great exposure for your blog and increase your site traffic, do not miss that opportunity because your images are not easily accessible to other bloggers. Bloggers work very hard to make their blog post images high quality and worthy of pinning. When a blogger is working hard to maintain a high level of visual content on their blog the last thing they want is to feature a blog post that has poor quality images. Ones that are too small, lacking in visual appeal, dull or boring image content, and poor font choices are not going to make the cut when featured posts are being chosen. Do yourself and your fellow bloggers a huge favor and up your image creation game so you can increase your chances of being a featured blog at your favorite link-up party. If image design isn’t your forte, consider hiring a virtual assistant that is experienced and proficient at creating high quality images. As with parties that you attend in person there is likely a theme, dress code, or other rules the party host would like you to follow. The same goes for link-up parties. When you choose to participate in a linky party be sure to read and follow all of the rules outlined by the blog host. If you do not want to follow the rules then simply pass that link-up by and find another one to join. However, if you do choose to join please make sure you abide by all of the rules set forth in the post. In doing so, you are being a good party attendee and working to maintain your online reputation. Linky parties can be a great traffic source for your blog when chosen wisely. In choosing to link-up at a party make sure to be a good party attendee and follow these basic rules of etiquette. Do you host a link-up party on a regular basis? Add your main party link to this Master List of Link-Ups so others can find you more easily. Alexis Mathews is a professional blogger and virtual assistant. She enjoys helping online business owners grow their business and realize their dreams. Premier Executive Media provides premier level business services to business owners and bloggers so they focus on what they love by completing the tasks they can't or don't want to complete themselves.